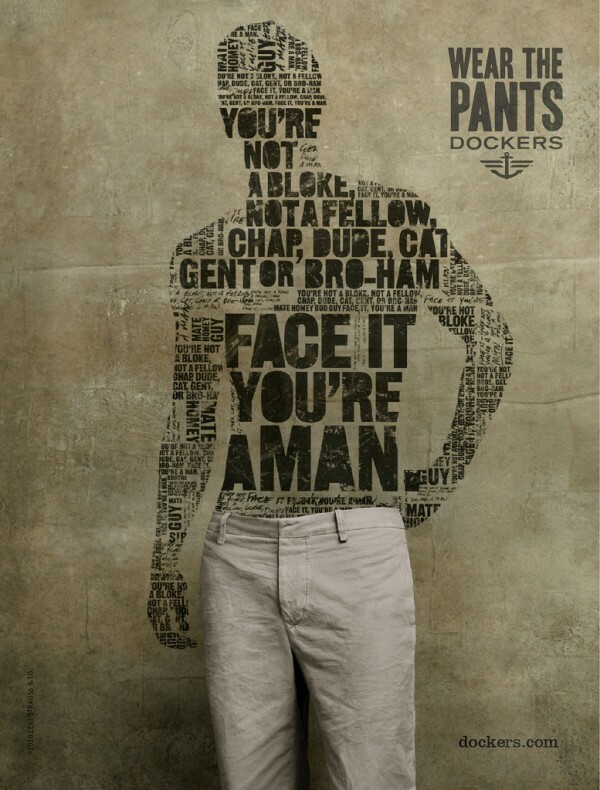 Last spring, Dockers launched its stupefying ad campaign based around the core message of “Wear The Pants.” (In a move that nicely reinforced the tone-deaf idiocy of the campaign, it premiered on International Women’s Day, March 8. Classy.) The whole series, which is still running in a slightly diluted form, rests on the premise that there is a crisis of modern masculinity: men are being devalued; technology has usurped men’s evolutionary and industrial roles; masculine traits are slowly dissolving in an increasingly androgynous society; men must take steps to reassert their waning influence. Watch out—we’ve hit Peak Masculinity! It’s all downhill from here as we tumble headlong into a genderless mire of murses, manicures, and manorexia. The only way to save yourself, you little sissy, is by buying these boxy dad-pants. This gender panic is an inexplicably popular trope among big media outlets: you see it in the Dockers campaign; the popularity of the drinkin’, smokin’, and pinchin’ ad executives on Mad Men; the ludicrous kook science of the “Caveman Diet“; the National Post‘s weird fixation on university gender studies. There’s the hideous neologism of the “mancession.” And more recently, we’ve had the Maclean’s cover story on why boys are growing up to be such a bunch of unemployable doofuses. Most recently, the Globe and Mail is flogging the notion with its “Failing Boys” series of articles, part of its pompous “Our Time To Lead” rebranding. Enough. This is all—if I can plausibly use such a Marlboro-man expression—horseshit. Similarly, when men—who demonstrably retain a firm grip on the levers of power in nearly every sector of society—plead that it’s they who are the victims, beaten down by a modern world that hates and fears maleness, tell them to shove it. Take it from me: I’m a middle-class, able-bodied, English-literate, university-educated, white, cisgendered male, and I’m doing just fine, trust me. I consider myself one of the most privileged creatures the planet has ever coughed up. Save your tears, ladies. The fact that, gosh, there are more female doctors than there used to be, or that some of the educational metrics indicate that boys’ classroom achievements are not as high as we’d like, is not, in any rational universe, a sign of the waning of the economic, political, and cultural dominance of men. Are there lots of boys who find school boring, irrelevant, meaningless, and get poor grades as a result? Yes, and that’s a real concern. But does it indicate that they’re growing up in a world where all the scales are tipped in the girls’ favour? No. The fact that literally millions of years of male supremacy is even slightly considered to be starting to be maybe, haltingly, partially alleviated is not an indication that men are suddenly marginalized. To say they are is wrong. Statistically, anecdotally, factually. Period.